It's been a long time since the last time I post book review here. It's not that I haven't read any books. I read some, but there was no book that I thought was worth to be reviewed. This one is different. 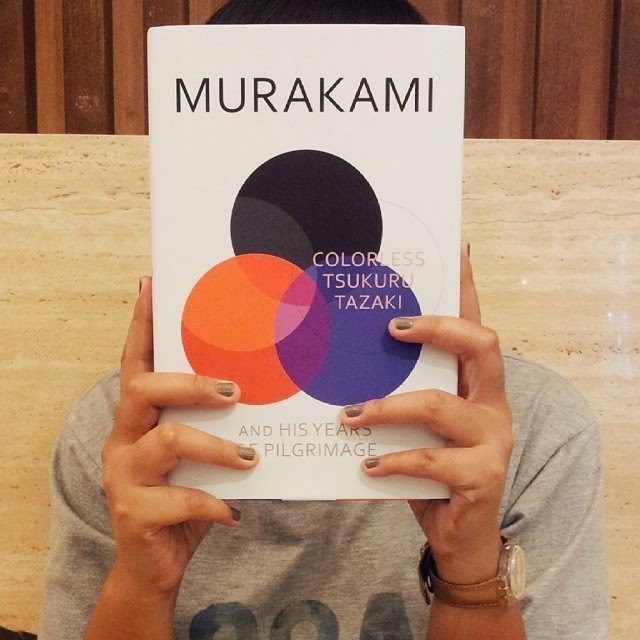 I've been a die-hard fans of Murakami ever since I read his book for the very first time. I've read most of his books (current progress: 13 of 15), and been collecting it as well. When I read the news that Murakami had published his newest book, I couldn't hardly wait until the English version launched. And when finally the day came, I ran immediately to the nearest book store to grab it. The title is Colorless Tsukuru Tazaki and His Years of Pilgrimage. The book is very beautiful. The kind of book that make you feel so happy to owned. The outer cover design is so simple yet stunning, and the inner cover has a very lovely pattern with lovely colors. The book came with free stickers of various illustration related to the story. The story itself is quite simple. There's a man named Tsukuru Tazaki. During his highschool years in Nagoya, he had a group of friends. There were five, including Tsukuru. The four friends all had last names that included color-words. Akamatsu : ‘red pine', Oumi: ‘blue sea', Shirane : ‘white root', and Kurono : ‘black field'. Tsukuru Tazaki had no color-words on his name, so they would joke that he was "colorless," which explains the rest of the title (and the cover). There was quite a strong chemistry between them that make them inseparable. But not long until they graduated from high-school. The four friends decided to stay in Nagoya. Tsukuru Tazaki alone went to Tokyo to attend engineering school. One day, when he went back to his hometown, his friends said that they don't want to see Tsukuru anymore. They rejected him with no explanation. Months and years with depression and loneliness. He thought nothing but death. Sixteen years later, he still has the wounds from that rejection. Now he has a new girlfriend, who encourages him to seek out the four old friends and find out what happened. She suggests that unless he deals with his old hurt, he'll never be able to move on. Just like Tsukuru, as a human we sometime might have some problem or question that might have been burdening us for a long time. This problem is just hanging, sometimes it is annoying as hell, sometimes it is forgotten. But no matter what, it is still exist. And unsolved. Some people maybe too afraid to face it and prefer to let it stay. Some other maybe couldn't solve it no matter how hard they tried and choose to close the problem thightly unsolved. The others may want the closure so badly, to finish all unfinished business so they can live peacefully in the future without any burden. This is a story about finding closure. To go backward and understand things. For Murakami's, this is quite a light reading. Though I think the story ended too early. But that's fine. Still, it was such a pleasure experience reading it. A very nice way to contemplate. You wouldn't just love or like the story, you will also appreciate the book itself because of its artistic cover design. Yes I think this is the UK edition. I just checked your review and I love the US edition! The rail map of Tokyo on the cover is just great.